Property-based animations are animations that interpolate values of a single attribute of a layer, for example, the position, background color, bounds, etc. This chapter discusses how Core Animation abstracts property animation and the classes it provides to support basic and multiple keyframe animation of layer properties. As with all animations, a property animation must be associated with a layer. The property that is to be animated is specified using a key-value coding key path relative to the layer. For example, to animate the x component of the position property of “layerA” you’d create an animation using the key path “position.x” and add that animation to “layerA”. You will never need to instantiate an instance of CAPropertyAnimation directly. Instead you would create an instance of one of its subclasses, CABasicAnimation or CAKeyframeAnimation. Likewise, you would never subclass CAPropertyAnimation, instead you would subclass CABasicAnimation or CAKeyframeAnimation to add functionality or store additional properties. The CABasicAnimation class provides basic, single-keyframe animation capabilities for a layer property. You create an instance of CABasicAnimation using the inherited animationWithKeyPath: method, specifying the key path of the layer property to be animated. Animatable Properties in Core Animation Programming Guide summarize the animatable properties for CALayer and its filter properties. Figure 1 shows a 3-second animation of a layer’s position property from (74.0,74.0) to a final position of (566.0,406.0). The parent layer is assumed to have a bounds of (0.0,0.0,640.0,480.0). The fromValue, byValue and toValue properties of the CABasicAnimation class define the values being interpolated between. All are optional, and no more than two should be non-nil. The object type that the property is set to should match the type of the property being animated. Both fromValue and toValue are non-nil. Interpolates between fromValue and toValue. fromValue and byValue are non-nil. Interpolates between fromValue and (fromValue + byValue). byValue and toValue are non-nil. Interpolates between (toValue - byValue) and toValue. fromValue is non-nil. Interpolates between fromValue and the current presentation value of the property. toValue is non-nil. Interpolates between the current value of keyPath in the target layer’s presentation layer and toValue. byValue is non-nil. Interpolates between the current value of keyPath in the target layer’s presentation layer and that value plus byValue. All properties are nil. Interpolates between the previous value of keyPath in the target layer’s presentation layer and the current value of keyPath in the target layer’s presentation layer. Note: On OS X the values passed to these properties are NSPoint structures. However, on iOS the types are CGPoints. Aside from that small difference, their use is identical. Listing 1 shows a code fragment that implements an explicit animation equivalent to the animation in Figure 1. Note: This example is for OS X. When compiling under iOS a small change is required. The NSMakePoint function is not available, instead use the CGPointMake function. Aside from that direct substitution the code is identical. Keyframe animation, supported in Core Animation by the CAKeyframeAnimation class, is similar to basic animation; however it allows you to specify an array of target values. Each of these target values is interpolated, in turn, over the duration of the animation. Figure 2 shows a 5-second animation of a layer’s position property using a CGPathRef for the keyframe values. Keyframe values are specified using one of two properties: a Core Graphics path (the path property) or an array of objects (the values property). A Core Graphics path is suitable for animating a layer’s anchorPoint or position properties, that is, properties that are CGPoints. Each point in the path, except for moveto points, defines a single keyframe segment for the purpose of timing and interpolation. If the path property is specified, the values property is ignored. By default, as a layer is animated along a CGPath it maintains the rotation to which it has been set. Setting the rotationMode property to kCAAnimationRotateAuto or kCAAnimationRotateAutoReverse causes the layer to rotate to match the path tangent. Provide an array of CGImage objects and set the animation key path to the content property of a layer. This causes the content of the layer to animate through the provided images. Provide an array of CGRects (wrapped as objects) and set the animation key path to the frame property of a layer. This causes the frame of the layer to iterate through the provided rectangles. Provide an array of CATransform3D matrices (again, wrapped as objects) and set the animation key path to the transform property. This causes each transform matrix to be applied to the layer’s transform property in turn. 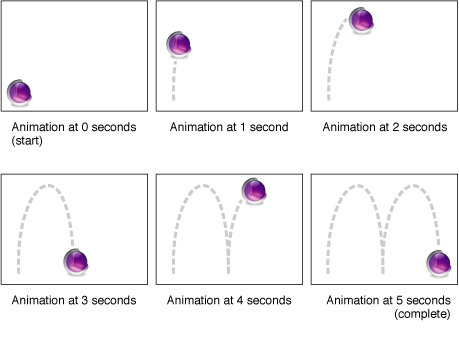 Keyframe animation requires a more complex timing and pacing model than that of a basic animation. The inherited timingFunction property is ignored. Instead you can pass an optional array of CAMediaTimingFunction instances in the timingFunctions property. Each timing function describes the pacing of one keyframe to keyframe segment. While the inherited duration property is valid for CAKeyframeAnimation, you can attain more subtle control of timing by using the keyTimes property. The keyTimes property specifies an array of NSNumber objects that define the duration of each keyframe segment. Each value in the array is a floating point number between 0.0 and 1.0 and corresponds to one element in the values array. Each element in the keyTimes array defines the duration of the corresponding keyframe value as a fraction of the total duration of the animation. Each element value must be greater than, or equal to, the previous value. The appropriate values for the keyTimes array are dependent on the calculationMode property. If the calculationMode is set to kCAAnimationLinear, the first value in the array must be 0.0 and the last value must be 1.0. Values are interpolated between the specified keytimes. If the calculationMode is set to kCAAnimationDiscrete, the first value in the array must be 0.0. If the calculationMode is set to kCAAnimationPaced, the keyTimes array is ignored. Listing 2 shows a code fragment that implements an explicit animation equivalent to the animation in Figure 2.